a year and a half behind in blogging, but better late than never, right? meet Brandi and Toby! Brandi, the golden retriever, is not new to the scruffy dog scene. this was her second session, only this time she brought along her new baby brother Toby from London for their dog photography session! looking back on Brandi’s first scruffy session, it’s clear that she’s filled out and matured a little, even though her energy and spirit are still very much ‘puppy’ like her brother. Brandi and Toby’s guardians wanted to utilize the scruffy dog settee this time around … and these two were more than happy to lounge. 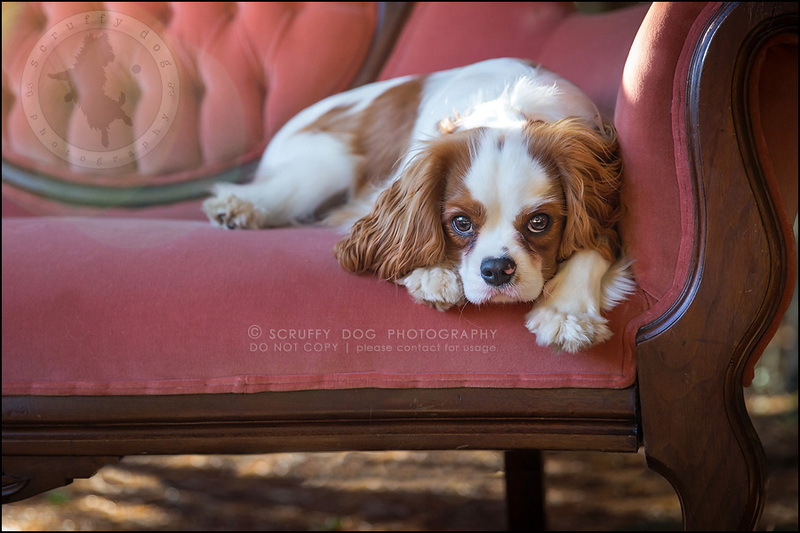 little Toby, at only 9 months of age, was still a handful to work with, but fortunately the cameras love King Charles Cavalier. thanks for continuing to trust me with your 4-leggers’ images, Bonnie and Giles. it’s always a pleasure to work with you guys! Hans Aberg - Wow.. These are the amazing pictures. I really love the pictures of dogs, as they look very cute and adorable. I always wanted to get the as such pictures of my dog too but it become very difficult for me to control him while photography.But, these pictures has really attract me.